Dongguan South-China-Sea Electronic Co., Ltd. is one of the large-scale manufacture bases of weighing systems and load cells in China. The brand of South China Sea is well received and recognized by customers, and has a good reputation both at home and abroad. Most of the company’s products are exported to Asian countries, European and American markets, with some market shares. Some of the exported products reach the technical standard for the same type of products in Europe and America, and are completely alternative to products made overseas. South-China-Sea Electronic Co., Ltd., since its establishment, has developed a professional technical team with the research and development ability. Professional technicians and the personnel for new product development and production have a mastery of techniques and innovative knowledge with much experienced. Technical performance of the products is among the best in the same industry in China. Meanwhile, South China Sea establishes cooperation with domestic professional colleges and scientific research institutes, hiring many experts in the electrical logging industry as its technical advisers. Last year, South China Sea and the University of Electronic Science and Technology of China jointly set up the “Post-doctoral Innovation and Practice Base of the University of Electronic Science and Technology of China and Dongguan South-China-Sea Co., Ltd.”. The establishment of the Post-doctoral Innovation and Practice Base has significantly enhanced the scientific research cooperation between the company and the University of Electronic Science and Technology of China, laying a solid foundation for better introduction of senior technical personnel, so as to create a higher platform for the future improvement in the technological level and product quality of the company. South-China-Sea, relying on advantages in the Pearl River Delta such as efficient information and convenient transportation, constantly promotes the enterprise competitive advantages and the market shares of its products. It emphasizes on the research and development of new products and seeks for autonomous knowledge innovation. Over 30 products of the company obtain design patents, among which, the Portable (Wireless) Wheel & Axle Weighing System honorably won the national design and invention patent. Meanwhile, South-China-Sea makes efforts to expand the global market, standardize the manufacturing management, promote the quality of export products, and have passed multiple international certifications of ISO9001: 2008, OIML, CE, RoHS, etc. The company strictly performs the ISO9001:2000 International Quality Management System. The leading products, both the resistance strain gauge and the load cells, have obtained the certification of environmental protection from the EU (RoHS); weighing load cells of multiple models have obtained the OIML certification; the electronic products have obtained the CE certification; and load cell products, electronic platform scales and stationary-type dynamic motor truck scales have all obtained the license for manufacturing measuring instrument. In 2004, South-China-Sea honorably won titles of “Guangdong Province High-tech Enterprise” and “Private Technological Enterprise in Guangdong Province”. The company was awarded as the “Reliable Enterprise in Compliance with Contract in Guangdong Province” for six years in succession and high-tech enterprise with technical content in the meantime. In 2009, the company successfully passed the ISO-9001: 2008 Certificate of Quality System. Relying on the profound technical strength and the consciousness for the best, South China Sea is making constant progress and rising in the weighing apparatus industry. In the exhibition, Xiong Wei, Manager of the Marketing Department of South China Sea, said that the company exhibited 6 types of new products this year. Since the company participated in the exhibition for the first time, South-China-Sea has specially designed and decorated its booths every year except the first year. The booths are getting bigger and bigger. The number of customers who know about South-China-Sea is increasing. Therefore, every penny spent here is worthy. Nowadays, as customers from overseas are increasing, 60% of the company’s products are exported to all the continents, in particular the Southeast Asian market which is the main market. At present, South China Sea is quite competitive in markets both at home and abroad. 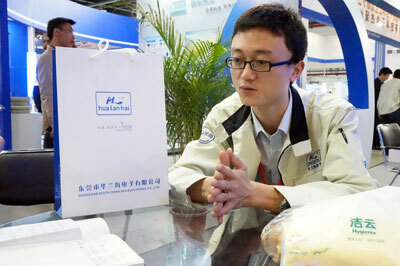 Xiong Wei said that brochures issued by the company in the exhibition increased year by year. This year, the company brought two types of over six hundred brochures and they were all sent out within one day, which made the company feel like “unprepared”. Xiong Wei said that South-China-Sea was going to hold a new product release in July in the “local” place, not only as a warm-up for the celebration of the tenth anniversary of the company’s establishment, but also as a “rehearsal” of its exhibition in the InterWeighing2014 held in the main market of Dongguan. Meanwhile, as an exhibitor, South-China-Sea looks forward to a larger exhibition area and more overseas customers. As customers are paying increasing attention to brands, this exhibition is the best platform to promote the recognition and image of enterprises.